My brother was, among many other things, a beekeeper, a pretty good one. He kept anywhere from 4 to 8 hives of bees. The bees were kept in a square wooden box about 14 to 16 inches high and 2 feet square called a hive or a gum. (The group of bees that lived in one such wooden box was also called a hive. That makes the matter more confusing. The term gum for that same wooden box came, I think, from wild bees that had established a hive in a gum tree.) The box had vertical wooden frames, about one inch wide, going clear across the box. The frames had thin wires running lengthwise in them. Those wires, along with strips of beeswax attached to the tops of the frames with a warm iron, provided a foundation on which the bees stored their honey. The hive had a ledge on the bottom on the outside with a 1/4 inch by 10 - 12 inch opening for the bees to enter and leave the hive. The lid sat on and down over each side by an inch or so and was weighted down with heavy stones. 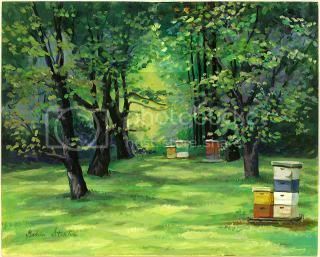 Once a new hive was established, it was not disturbed as long as the bees stayed in it. All honey stored in the hive was for the bees’ winter food. A “super” was placed on top of the hive for the honey to be harvested. It was the same size as the hive (the lid fit it, too) and about 6 inches high. It was filled with long frames or 6 inch square honey boxes, the ones you see in some markets that hold about a pound of honey. A strip of commercially purchased beeswax was attached to the frames or to the box as a foundation for the honey. A strong hive could fill 2 or sometimes even 3 supers of honey in a good year, but they only stored honey in the super after the bottom was filled. Weaker hives and bad honey years sometimes meant that they couldn’t even fill the hive itself. Late spring frosts killing all the blooms could cause that. An abnormal amount of heavy rain can also do it. Sometimes they have to be given sugar water as supplemental food. There are several kinds of honey based upon color and flavor. A beekeeper can identify the source of the honey by either its color or its flavor. Generally, the darker the color, the stronger the flavor. Basswood honey, made from basswood tree blooms, is a very light colored honey. Most people like lighter honey best, but I prefer darker honey. Locust honey is a bit darker (I think) and clover honey is even darker. I think apple honey is fairly light. Honeybees are very fascinating creatures. I don’t know enough about them to get into a comprehensive description, but it is worth your time to do some research on them. There can be only one queen bee in a hive. She lays all the eggs that hatch into replacement bees. The eggs are fertilized by one male called a drone. A hive has many drones, but only one fertilizes the eggs. The rest lay around and eat and drink, and probably gossip and complain about the quality of the honey like, well, like the drones we all know. The worker bees do all the work. They have to fly thousands of miles and visit millions of blossoms to make one pound of honey. Scout bees find sources of honey, and there is some sort of communication between the scout bees and the ones that gather the honey. Bees are extremely important in nature and to farmers. As they go from one blossom to another, they pick up pollen on their legs and deposit that pollen on other blossoms fertilizing them. Butterflies and hummingbirds, as well as other kinds of bees, also do that. If that is not done, in many cases, the fruit will not form. A few years ago, there was a problem with mites that killed most of the honeybees around the state. 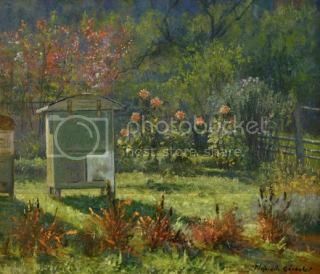 Orchard owners in the eastern panhandle rented hives of bees that were resistant to the mites so that their orchards would produce. The amount and importance of pollen and pollinating crops can best be illustrated by an ear of corn. Each grain must individually be pollinated through the silk to develop and mature. Mankind simply could not survive without bees. Food production would plummet to nearly zero, and we would starve. Prophets of gloom and doom love to tell us the dire consequences of man-caused catastrophic global warming - a hoax. But the threat and the possibility of losing our bee population is very real. Beekeepers can buy new hives, they can harvest swarms, or they can capture wild bees to grow their business. 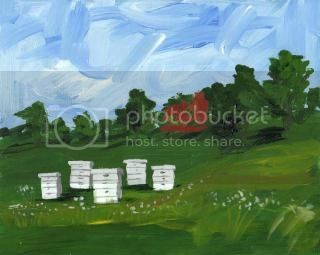 Bee hives are available by mail order - I suspect that they are delivered on time, and very carefully. If you want to ship something very fragile, it may be a good idea to label it “Live Honeybees.” Capturing a wild hive has been done many times, but I’ve never seen it. You would have to capture the queen and carefully place her in the new hive and make sure that she could not escape. The rest of the bees would then join her. I would try to do that at the site where the wild bees lived. Then, late at night when they are all in the hive, seal the hive and bring it home. That would have to be done in spring or early summer so the bees would have time to store enough food for winter. Capturing a swarm is much simpler. A swarm occurs when a second queen is born in a hive. One queen will leave with roughly half of the worker bees. Seeing a bee swarm in the air is awesome. It looks a little like the descriptions of the grasshopper swarms in the mid-west. Swarms usually do not go very far. They light on tree limbs or the sides of buildings. They are looking for a home so are much more easily captured that the wild bees - you have to remove the wild ones from their home. I’ve seen swarms on a tree limb, all in a knot, 12 to 14 inches long and 6 to 8 inches in diameter - very impressive. I once saw a swarm at the prison where I worked. The inmates, mostly from cities, had never seen anything like that. They were pretty excited and pretty scared. It landed on a wall and stayed an hour or so before leaving. Flies off with the nectar. My brother wanted to teach me to be a beekeeper so I agreed to help him capture a swarm. It landed on a tree limb about 6 feet high, only about 30 - 40 feet from the mother hive. He got me all dressed out - hat and bee veil tied tightly around the neck, long sleeves and gloves, boots, and tape around my pants cuffs and sleeves. I made sure that I was well-protected. After we were dressed for the job, we made a table with sawhorses and boards under the swarm. We put the new hive on that makeshift table. The idea was to get the bees down on the table and to drive them into the hive with a bee smoker. The bee smoker is a canister device with a bellows and a round nozzle to concentrate the smoke where it is needed. It is packed with burning rags. The bellows keeps them producing smoke. The bees will do about anything to avoid that smoke. To make the capture, He had to smoke the queen into the hive. The others would then follow. When we were ready, I hit the tree limb smartly with a sledge hammer. The bees all fell off the limb onto the table. He started smoking them into the hive. But at least fourteen million of them flew up and flew in circles around me. I panicked. I didn’t run, but that had more to do with paralysis than courage. Mason did get the queen into the new hive and the others followed. I was able to help him carry the hive to its new home on the stand with the others. Then, I took off the equipment and said, “Never again!” That is a promise I had no trouble keeping! I admire beekeepers, and I love honey, but I could never be a beekeeper. 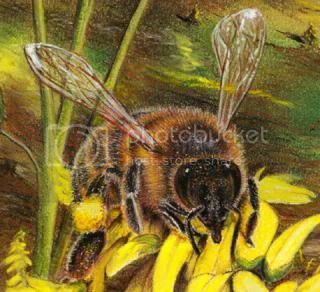 Old timers found bee trees, wild bee colonies, by going to a source of water and watching for honeybees. Honeybees need water constantly. They would follow a bee as far as they could see it, mark that point and go to it, and then wait for another to come along and follow it. They repeated the process as many times as needed. People lost without water have also followed bees from their tree to a water hole by doing the same thing. That is the origin of the term “bee line” meaning a straight line. Bees have to move very fast to stay still.